E: What a real pleasure it was to see this show again, especially in a week of reruns and concept shows! Even if I did enjoy The Sing-off. Sorry the recap has been so long in coming; Christmas with four small children can be pretty all-consuming. This episode is all about nuance, about shades of gray, liminality, and where the lines get crossed. All in all, it was a terrific way to end the show’s 2009 run. If it’s Christmas you celebrate, you probably have your favorite books, movies, or CDs that you pull out every December. At the old Quibbling homestead there’s a record of the Chipmunk’s “Christmas Don’t Be Late” just waiting to hit the turnstile… if anyone could find it. While we all have our favorites, though, one can start to feel overexposed to the Christmas media standards. If you’d like to sit down by the roaring fire with your cup of wassail and put on a flick that isn’t It’s A Wonderful Life or A Christmas Carol (though Relatively Entertaining loves both) then this is the post for you. These are movies which, though not exactly in the Christmas canon (and that’s canon with a small ‘c’, thus not the Trans Siberian Orchestra song), but have a touch of that spirit. While they’re good all year long, now’s the time when we especially feel like renting them or pulling them off the shelves. And we think you might too. E: I doubt it makes The Quibbling Siblings unique to say that we loved holiday specials growing up. There’s something so, well, special about that once a year viewing, the great songs and the stop-motion animation. These days, most Christmas specials are available on video. M and I have most of them saved on our DVRs right now. Which are you favorites? Here are ours. 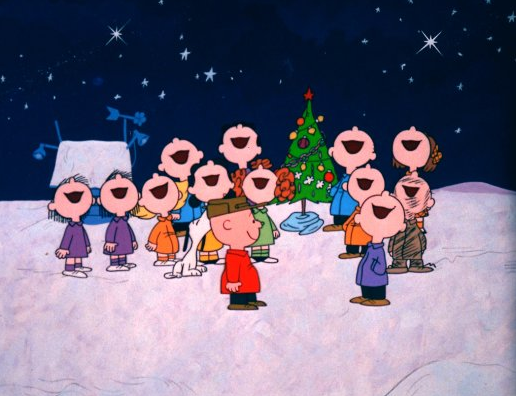 A Charlie Brown Christmas: This is a true Christmas special, between the Peanuts gang putting on a Christmas pageant, Charlie Brown’s rant against fake trees and the out of control materialism of the season, to Linus’ simple quotation of scripture to bring everyone together and back in tune with the true meaning of the celebration. I mean, come on. They actually quote the gospel on a Christmas special! That seems pretty revolutionary these days. (C: It was even revolutionary in 1965 – I know the network wasn’t happy about it.) The soundtrack is magical, and so is the little tree. Oh, and the Snoopy dance, too. Dr. Seuss’s The Grinch Who Stole Christmas: A classic. Who can forget Cindy Loo Who, the little dog with antlers, the caroling Whos down in Whoville, or the roast beast? Grinch has some of the best songs of all – “You’re a Mean One, Mr. Grinch” cannot be surpassed with a 10 and half foot pole. E: May I begin by saying how much I hate that they don’t do have supporting categories in the SAG tv awards? Some years, a supporting player sneaks in, and that’s supposed to happen, but just you look below and tell me about it. Lots of good people are not on this list, y’all. You just can’t fit them all! And honestly. Let’s face it. Supporting characters are often way more fun and interesting and exciting than the leads. Writers can be riskier with supporting characters. They don’t have to care so much about always being likable. Also? Most of their choices? I have one word. The Ensemble category is the SAG equivalent of Best Picture, and it tells us a few things. An Education appears here, which didn’t at the Globes. The Hurt Locker, Precious and Inglourious Basterds have appeared in both places, and that bodes well for them. Especially with ten places available in this year (and not to sound like a snob, but I can’t help thinking that sort of cheapens the brand) you have to think those three movies have a really solid lock. A movie I’d have thought was a lock – and probably still is – does not appear on this list. Two days ago Up in the Air was the Globe’s favorite movie with 6 nominations. It’s exactly the sort of flick I’d expect SAG to go for – it’s heavy with impressive acting, it’s witty and light and fun. SAG gave its Ensemble award to Sideways, after all, and you have to feel like these two are kin. (You remember Sideways, right, that odd little love letter to pinot and whiny men? Didn’t win Best Picture – which goes to show that SAG and Oscar have distinct tastes – but it was nominated.) Anyway, I just don’t know what to do with that. I expect it will still make the final cut, but I’d been sort of envisioning it as the possible frontrunner, and it’s very unusual for a movie to win the Oscar without even being nominated for the SAG Ensemble award. Not impossible, but definitely a buzz kill. I’m thrilled to see An Education here, though; that was a film I expected the Hollywood Foreign Press to like more than they did. You can’t count it as an Oscar lock; were it any other year, I’d say you could almost count it out of Oscar contention, but with 10 slots, anything’s game. Which leaves the star-studded musical Nine. Any other year I’d count that one out, too, because the reviews imply the film’s promise has not been fulfilled, but again, it’s really hard to say. So many variables! It gives me a headache. Invictus is missing from this list, too. That’s a movie which is likely to make the Oscar long list. Unlikely Up in the Air, I don’t really know that it can win Best Picture, so its snub here is less damaging. Another notable omission from the Golden Globe Drama Best Picture slate is the would be blockbuster Avatar. That’s going to be a curious one. Remember 12 years ago when Titanic came out? It had been delayed 6 months, it was the costliest movie ever, and people were saying it could either be a disaster or the best movie ever. Most industry folks were betting it was a disaster. We all know how that one turned out. Will Avatar be the same sort of smash? It’s got the same sort of confused buzz. Depends on how many women will show up to watch 10-foot-tall blue aliens fall in love, I think. And I’m inclined to think that’s not as many as the producers would like. And as I heard last night on the finale of So You Think You Can Dance, the movie’s love theme (“I See You,” sung by Leona Lewis) is no “My Heart Will Go On.” Still, I’m hoping the movie’s a good one. What will this do to its Oscar chances? The reviews and soon-to-be box office will probably determine that, rather than anything the Globes or SAG does. E: Since we don’t have any Oscars to reflect off of, I’m just going to react here. These are actually pretty unsurprising. I’ve never seen a single episode of Big Love; I’m curious if it lives up to the hype. I’m happy to see Bill Paxton so successful, anyway. Actually, I don’t watch any of these shows, although if I had HBO I might watch True Blood. Absolutely no broadcast love – well, except House on FOX. What I mean is, no Lost, no Grey’s Anatomy, no FlashForward or V or anything. Hmph. Sorry, nets. I’m definitely bummed not to see The Good Wife here. E: No, it’s not the very first of the precursor awards. We’ve had more than a few sets of nominations come out already – the National Board of Review, the Golden Satellites, the Broadcast Critics, the LA Critics, the New York Film Critics Circle, the list goes on. The Golden Globes are besotted with celebrity, love some actors above others, and their supporting nominees tend to stack up inaccurately with Oscar’s . And the Screen Actor’s Guild might be slightly better at predicting the big award winners. Still, Hollywood’s booziest show is still its best Oscar indicator – not to mention the most entertaining awards show – and might even be more important this year considering the big jump from 5 to 10 best picture nominees. The Golden Globes have always had at least 10 (5 for drama and comedy each) and usually spill over, especially in the drama category. And usually the lead acting nominations include nearly everyone who’ll be in play for Oscar nods.